In response to the guiding principles in the Transit Strategy, the new Bus Network has a number of different route types that will help meet the various types of travel needs throughout the city. In spring 2018, our transit planners carefully reviewed public feedback and made a number of changes to the proposed bus network. They are currently reviewing fall 2018 public feedback and may make minor changes where warranted before the final draft is presented to City Council for final approval. The final draft of the proposed network will be posted here in late fall 2019. LRT Network: These routes will provide frequent service at all times. Bus connections will integrate with LRT stations. Frequent Network: Inner areas of the city (75 Street to 170 Street and Whitemud Drive to 132 Avenue) will have more frequent service with buses coming every 15 minutes or better at all times of the day, seven days per week. Express Routes: Suburban areas of the city will have express service to downtown and the University of Alberta during rush hour, and these routes will have a fewer number of stops. Neighbourhood Routes: There will be many local routes that connect people to the LRT, main bus network or local destinations. Suburban communities will also have routes that cross the city with no need to transfer downtown. In many neighbourhoods, service will be extended later into the evening and on weekends. Community Routes: ETS is reviewing the community route network to see if the resources can be better used to serve seniors. This could mean an on-demand option which is better suited to meet seniors’ needs. 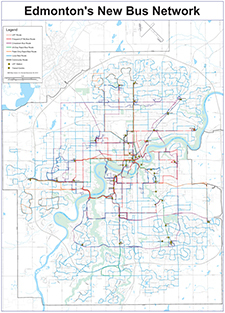 View drafts of the proposed bus network from the spring 2018 public engagement sessions. The Transit Strategy has some guiding principles, under Pillar 3, Develop a Market-Responsive Approach to Transit Network Design, that influenced the development of the new bus network.